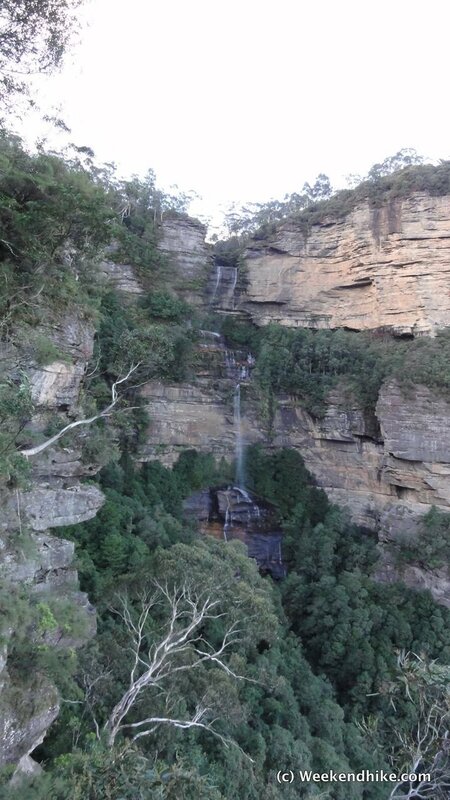 While this hiking area can be accessed by Car or Train from Sydney - its far easier for visitors to Sydney to book the Small Group Hike offered by Lifes an Adventure or simply book this tour online on Viator. 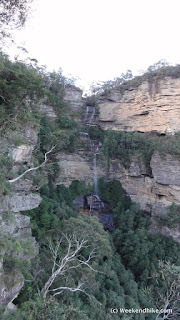 By booking the tour, you get a hotel pick-up/drop-off, lunch, a experienced guide and all access fees paid for in the cost of your tour - its by far the best way to day hike the Blue Mountains from Sydney plus avoid the crowds. 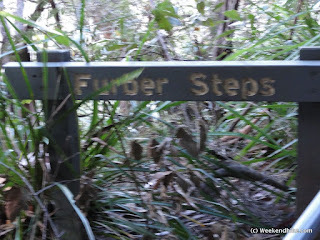 This hike starts out at ScenicWorld after checking out our destination at Echo Point where you have a good view of the Three Sisters as well. 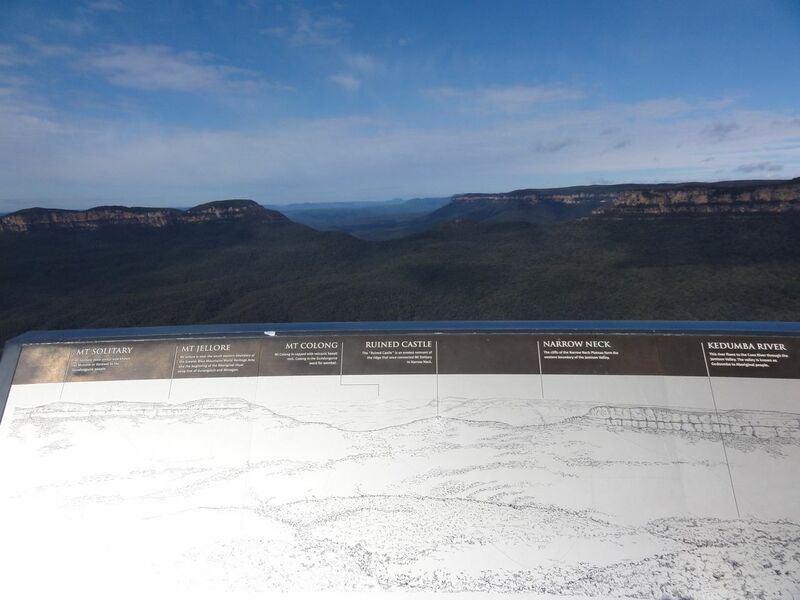 You can get a clear view of most of the route from the Echo Point Viewpoint (see sign below). From ScenicWorld you have a couple options to reach the start of the hike. 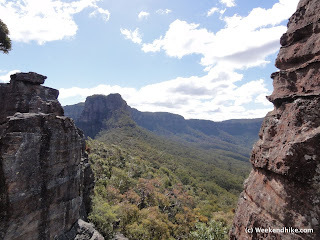 The Valley floor is accessible via the Furber Steps, Scenic Cableway (Tram), or the Railway which is the the steepest incline Railway in the world. 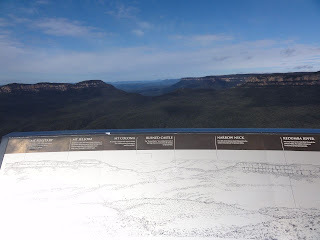 Our group took the Cableway down - which offers a great view of the Jamison Valley. There is a cost for the railway or cableway - but it is included if you booked via Viator. 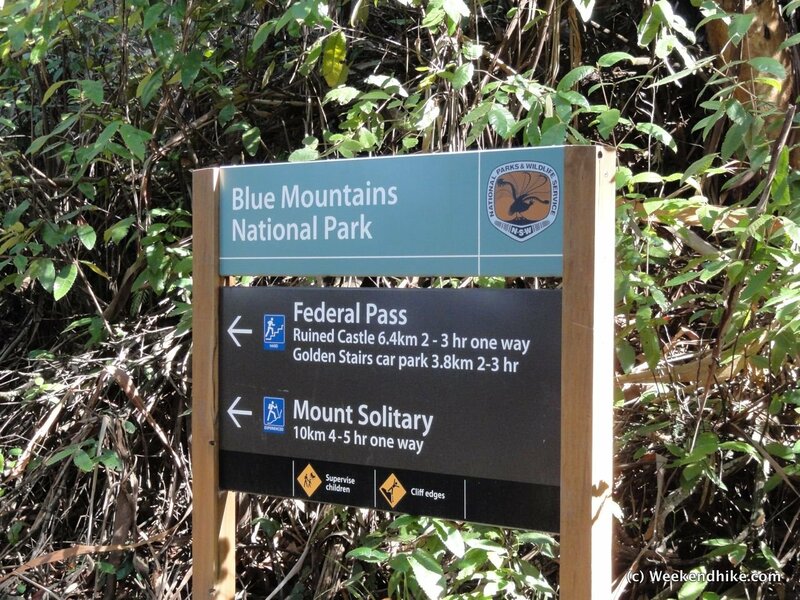 The hike follows the Federal Pass trail for a couple hours - the first part of the trail is a bit hard as you hike (almost scramble) over a landslide area. You pass under the the shear cliffs from where the landslide started. 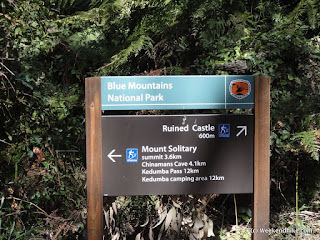 Not too much wildlife to see except for the Bell Birds, Lyrebirds, and Cockatoos. 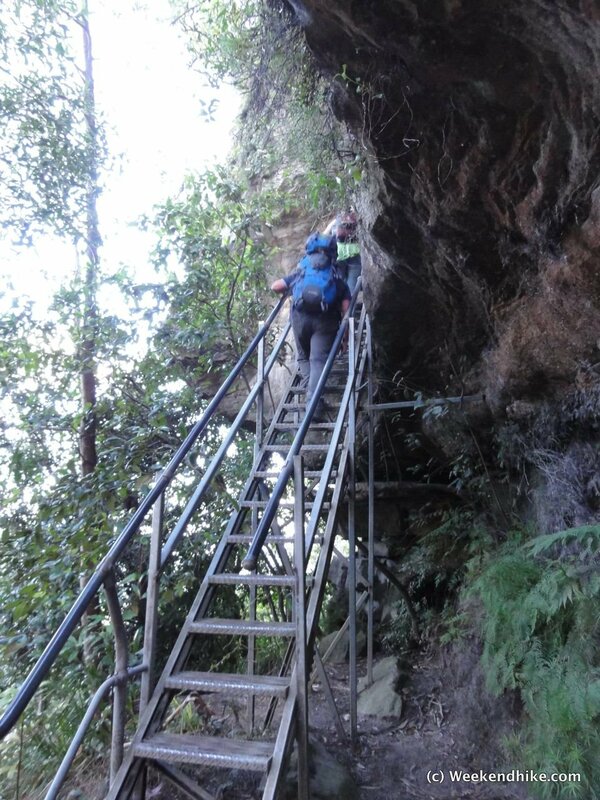 The trail is well defined and maintained past the landslide section. 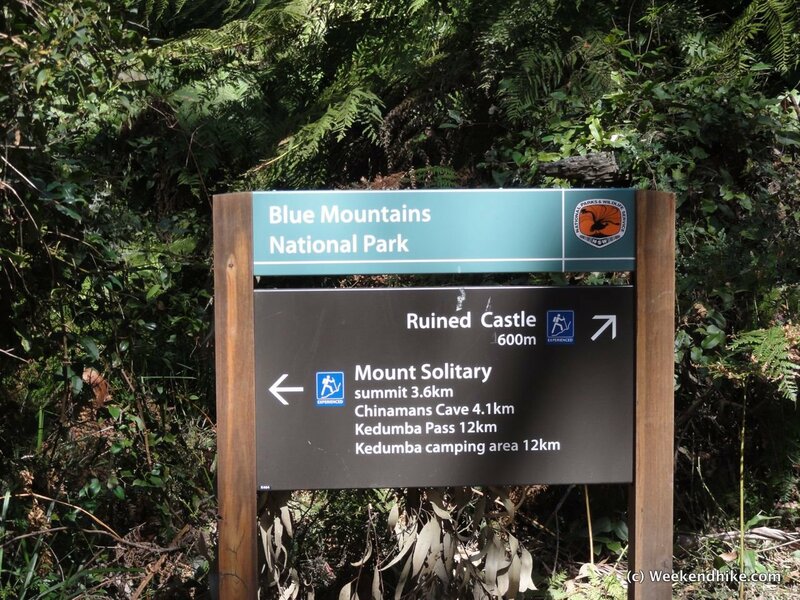 Much of the hike past the landslide part is covered by tall trees, mostly eucalypts. After a good two hours, you reach the Ruined Castle cut-off to the right. Our group was one of the first to arrive (another plus for booking with a tour), so we enjoyed almost solitude on top of the Ruined Castle where we had a nice lunch. The views were amazing -- offering 360 degree views of the area. I hesitate to post too many photos or video of this point as it is one the Top 10 best views I have seen on a hike, since really even photos dont do it justice -- it is best seen in person. The return trip follows the trail back to the cableway/tramway landing area. 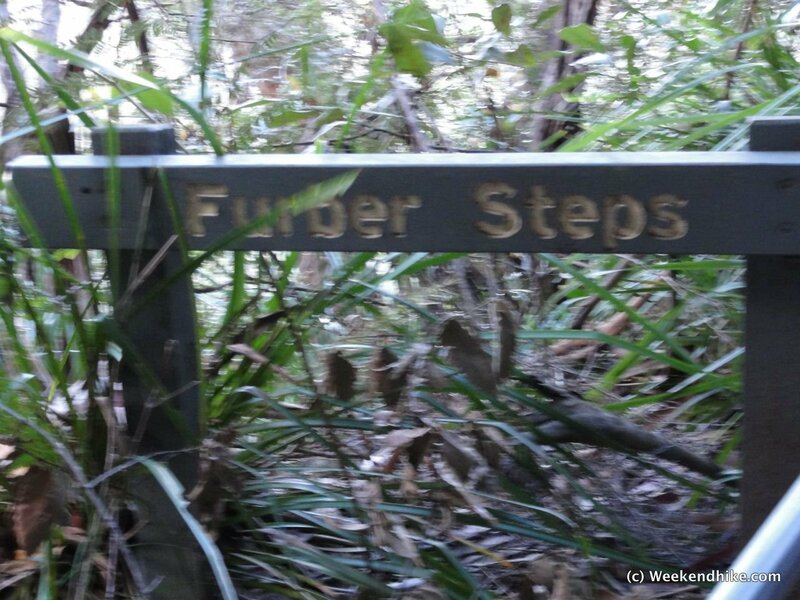 Our tour continued past the "easy way out" (which closes promptly at 4:50pm) and took to the Furber Steps for our way out of the Valley. This route offers great views of Mt Solitary, the three sisters and Katoomba Falls. The route takes you back to ScenicWorld where you started. Upon returning, you can use the restrooms at ScenicWorld before headed back to Sydney. Dont wear jeans/shorts - the hike is too active of a scramble for Jeans. There is a bit too much brush and rock climbing for shorts. 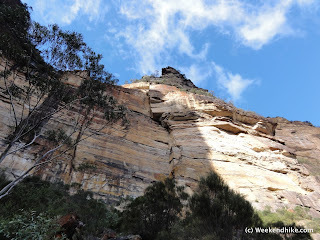 Good shoes - while regular tennis shoes were probably ok, I was very glad to have my hiking shoes on so it could grip the boulders at Ruined Castle. 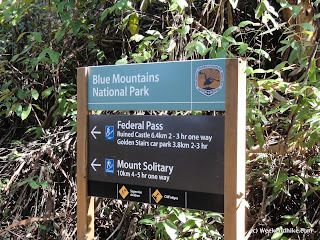 A great Blue Mountain adventure for active hikers - nothing too challenging, but it was nice to be on a small group tour. Best of all the Viator tour picks up at your Sydney hotel and brings you back before dinner -- much easier than messing with your own transportation or dealing with a long train ride. 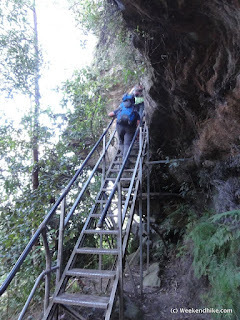 Getting There -Book with Lifes an Adventure or book online on Viator.